Plot: An animation in which the story is told by the music of great classical compositions. An epic set of stories in which art was drawn to match classical music compositions. This is a classic in music and animation. An animation in which the story is told by the music of great classical compositions. Beautiful animation and a wonderful score. In the time where CGI or computers were present, this was purely crafted out of hard work. The animation, hand drawn, inked and sketched to perfection with skilled editing for the musical accompaniment. A landmark for animated films since the iconic figure holds the baton and manages the picture. Fantasia is a work of art which may not be for everyone, but is considered one of the landmark classics for this genre, even for Disney. If music were a painting, it would be Fantasia. After re-watching it tonight, I remembered why Fantasia was my favorite animated movie of all time, for a number of reasons. It is as much creative as it is difficult to understand, but after a while you stop trying to understand it and understand it for what it really is: an absolute work of masterful art. With no dialogue and minimally detailed story lines, Fantasia still manages to captivate its viewer and offers a broad spectrum of amazing animation, synchronized with world-famous classical pieces. There comes a time in every critic's life, in which they have to give a negative review to a well known and loved classic. Unfortunately, I am in the situation of giving a negative review to one of the best known and best received animated films of all time; Fantasia. Fantasia really doesn't have a plot of any kind. Instead, it boasts a unique premise. 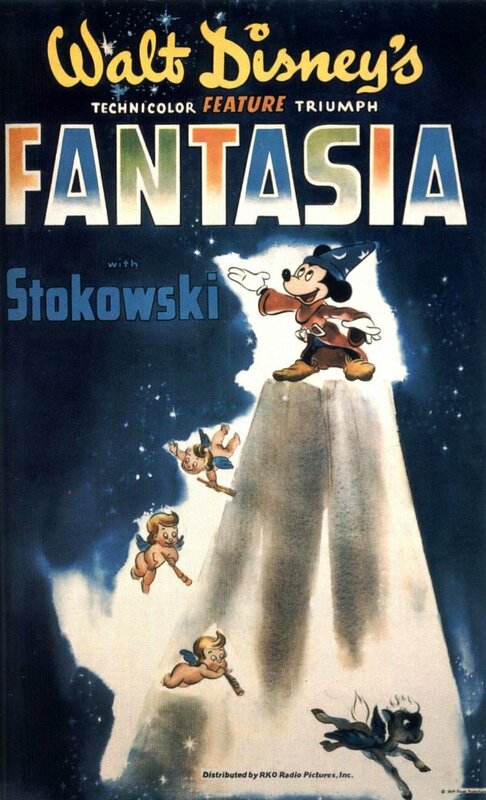 We are introduced at the beginning to a new kind of entertainment called Fantasia. This is a combination of music and visuals. There are three different varieties of this: The first being music that tells a story. The second being music with no particular plot, and the third being music that exists just for music's sake. Disney was the first person to prove that animation could in fact be an art form. The project, which originally started with the short �The Sorcerer�s Apprentice� and grew to something bigger, is still known today as one of the most original and epic of Disney films, and even animated films. No posts have been made on this movie yet. Be the first to start talking about Fantasia!